At the age of 24 i think i have finally nailed my skincare routine. 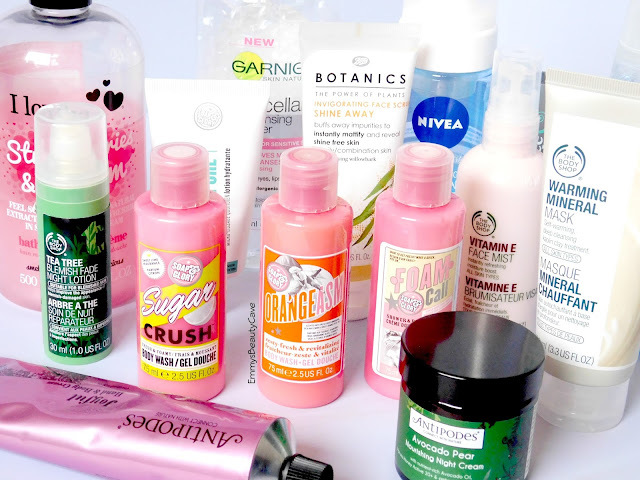 Finding products that work for your skin can be a nightmare and it has taken me a long time. Having the perfect skincare routine doesn't mean you have to have the most expensive products, 99% of my products are drugstore brands. If i could give one bit of advice it would definitely be if you find a product that works for you don't change it! My skin is combination-oily depending on the weather and how my skin decides to act. Makeup Remover: For me ever since it was released i have been obsessed with the Garnier Micellar Cleansing Water (£4.99 Feel Unique). I was amazed at how easily it removes my makeup with one swipe! I pour a small amount onto a cotton pad and swipe away. It removes the heaviest eye make up in seconds. It keeps my skin extremely soft. 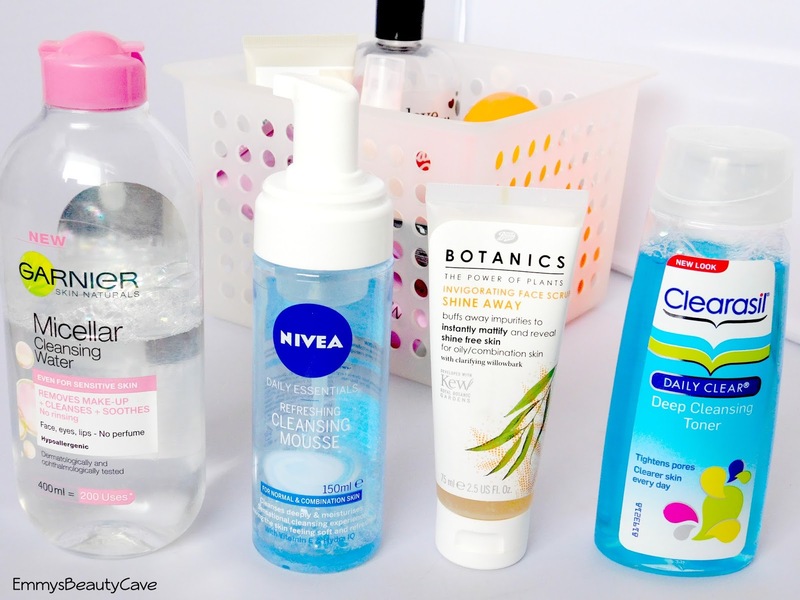 I always find removing my makeup first with a cleanser helps keep my skin fresh. 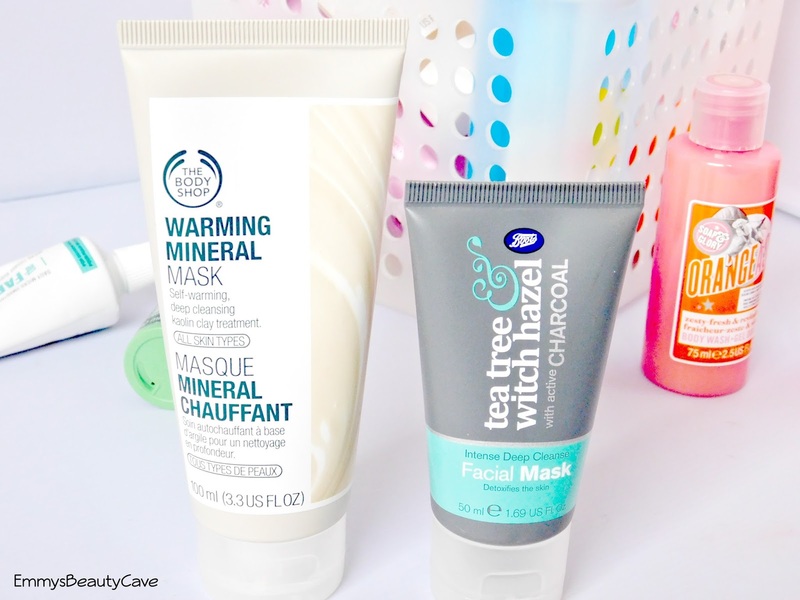 Face Wash: I use two face washes and stick with them. I switch between the two depending what my skin is like. If my skin is pretty clear i will use the Nivea Refreshing Cleansing Mousse (£4.99 Boots) which is amazing. It turns into foam which makes it easy when washing your face. It removes any left over makeup and my skin always feels super soft. Secondly i use the Botanics Invigorating Face Scrub (£1.00 Boots), i mainly use this one when i am suffering from breakouts or my skin is feeling a little dry. This has little bits in it which are perfect for exfoliating your skin. I removes any dry skin instantly. Toner: Toner is something i haven't always used. If im honest i never really noticed a difference using one until i tried the Clearasil Deep Cleansing Toner (£5.29 Superdrug) which helps to tighten pores and to keep your skin clear. It does have a very strong smell but once applied it goes away. I have noticed less breakouts since using this. It looks like Clearasil have changed this product slightly to the Clearasil Ultra Rapid Action Deep Pore Treatment Toner. The Wake Up Spray: When i have woke up and washed my face i will then spritz this Body Ship Vitamin E Face Mist (£9.50 The Body Shop) over my face. It helps your skin to feel fresh and preps it for any products you are about's to apply. You can also spray this on top of makeup to refresh your makeup, it doesn't make your makeup last longer though. Morning Moisturiser: I have recently fallen in love with the Soap & Glory The Fab Pore Moisturiser (£12.00 Boots + S&G). It is mint in colour and also smells like mint. It is a thicker consistency than a normal moisturiser but it blends into the skin well. I find it reduces shine and creates a lovely base. NOTE: I have found switching between two moisturisers every 2-3 weeks stops my skin getting used to one product. Night Moisturisers: Again as with day moisturisers i also switch between two night creams. Using one product everyday over and over your skin will get too used to it and it won't work anymore so switching them up every few weeks is a good idea. My favourite night cream is The Body Shop Tea Tree Night Lotion (£10.00 The Body Shop), one of the best skincare products i have ever purchased. Since using this i barely ever get breakouts and my blemishes have reduced massively! 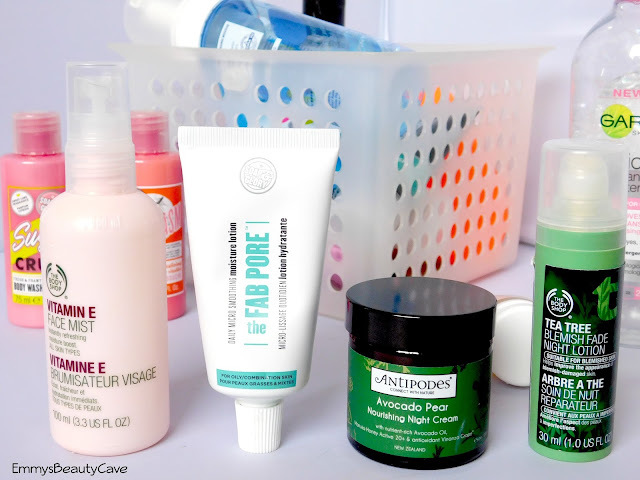 The second night cream i use is the Antipodes Avocado Pear Night Cream (£29.75 Beauty Bay) which i did recently review here. It is very light weight on the skin and is full of natural ingridients which work really well on my sensitive skin. I like to switch my face masks up depending on how my skin is feeling. Sometimes i can have really oily skin the next minute i have huge dry patches on my cheeks and it looks very dull. I can't win! One of my favourites is The Body Shop Warming Mineral Mask (£11.00 The Body Shop) which heats up as your rubbing it between your fingers, it doesn't stay warm whilst on your face though but it definitely makes my skin feel instantly refreshed and super soft. Another favourite more for when my skin is being its horrible oily self is the Boots Tea Tree Witch Hazel Deep Cleansing Mask I apply this all over my face and leave it around 15 minutes and i do notice my skin feels matte afterwards. Bath & Shower Gel: This is my bargain buy! The I Love Bubble Bath & Shower Gel Strawberries & Cream (£1.49 Superdrug) it smells lovely! They have a wider range in store than online but you should definitely try them out. I use this as a wash but also for bubbles in the bath. Body Wash: Soap and Glory i am loving lately. I got a few bits for Christmas which i am still making my way through. 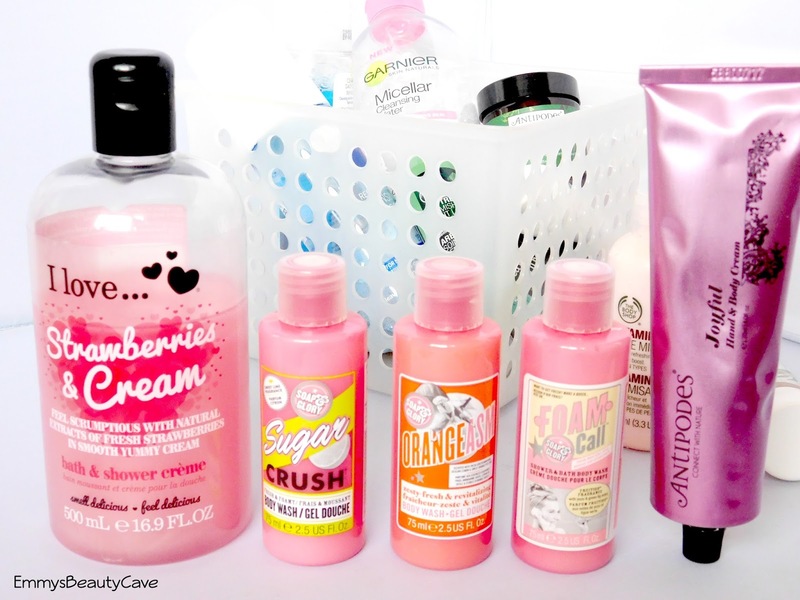 I am currently using the Soap and Glory Sugar Crush Body Wash which has a grainy texture, perfect for exfoliating, The Soap and Glory Orangeasm Body Wash which smells amazing and the Soap and Glory Foam Call which are all £6.50 from Boots for the Full Size Bottles. After Care: After the shower or bath i apply a body cream to keep my skin soft. I am obsessed with the Antipodes Joyful Hand & Body Cream (£28.99 Feel Unique). It smells gorgeous and the packaging is stunning. Sometimes i just apply this on dry areas, knee, elbows etc and my hands but now and again i will apply it all over. Are any of them now on your wishlist?